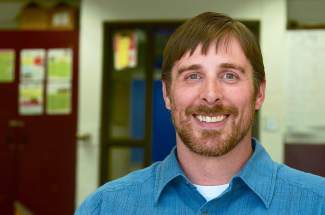 Jim Smith is in his second year as principal of Snowy Peaks High School in Frisco, and has spearheaded the program's shift to a new blended learning curriculum. From a room full of kittens to trampoline floors, Snowy Peaks High School students dreamed big when they created wish lists at the end of the school year about how to improve their physical learning environment. Some of their more practical ideas will be realized when school resumes in the fall, including more flexible online education, more projects and classtime on couches. The Summit School District’s small high school is moving this year to a model called blended learning, in which students learn in part through online content and instruction with some element of student control over time, place, path or pace and in part at a location away from home with teachers. The school, now located in a wing of the Summit Middle School building in Frisco, will add two of the middle-school classrooms, tear down walls and create one 3,000-square-foot room where most learning will take place as part of the switch. The school district chose the blended-learning renovation as one of few wish-list projects to allocate funding for in the 2015-16 budget. “That feels really encouraging, like they really believe in what we’re doing,” Wolinetz said. Business services director Mark Rydberg said he expects construction will cost between $35,000 and $40,000, and the renovation also received a $5,000 Eileen Finkel Innovative Teaching Award through the Education Foundation of the Summit. Snowy Peaks principal, English teacher and student advisor Jim Smith said construction should start in July and will be complete before students return for school in August. He envisions the school’s main room — the size of four traditional classrooms combined — will look like a college library and feel like a combination of a relaxed coffee shop and an innovative tech company’s headquarters. Blended learning flips around many aspects of traditional education. Instead of having teachers give new material that students practice on their own at home, students will learn new material online while teachers monitor, check for understanding and connect with real-world applications. In one of the leading books on blended learning, “Disrupting Class: How Disruptive Innovation Will Change the Way the World Learns,” the authors describe how 50 percent of all high school courses will be delivered online by 2019. The online program will be the content provider, Smith said, while teachers will be facilitators, guides and mentors who jump in to offer one-on-one and small-group instruction for students who are struggling with certain concepts or skills. Days will be structured with rotating stations. For example, one group of students might arrive in the morning, go straight to a computer and work for 30 minutes. The software will give students feedback almost instantly, and teachers can watch their students’ progress and intervene immediately. The model will allow the school to stop going at the pace of the average student, where some students are bored and ready to move on and others are lost and falling behind. Instead, students can fly through material they understand and receive extra support if they’re having trouble. Snowy Peaks teachers and paraprofessionals will become like the pit crews in a car race, Smith said. Parents will also be able to use the program to check students’ progress and grades on a daily, weekly or monthly basis. Plus, Smith said the online component lets the school stop fighting students’ use of technology and instead leverage the digital skills the kids have grown up with. He maintained that online learning will be just one aspect of the school day, at least for the near future. “Students will not be stuck in front of a computer. This is not an online school,” he said. He said the school’s new flexible online-learning model should soon be able to provide an education for Summit County’s young elite athletes, who may want to train in the morning and study at night; but for now, students will still meet with teachers and their classmates at school during the day. “We don’t want kids to sit in front of computers for hours on end because that’s not good for anybody,” Wolinetz said. The second station kids go to in the morning might involve students working together in small groups, collaborating, teaching and learning from each other. Teachers will use that time to creatively engage students and ensure they are mastering topics and skills required by state standards. Then in the afternoons, students will focus on projects, which in previous years the school used as a one-time senior year requirement. Now, students will use projects throughout their time at Snowy Peaks to delve deeper into subjects and skills that interest them. They will also work on school-wide projects that incorporate STEAM — or science, technology, engineering, art and math. Meanwhile, the school will stay true to the core aspects of its character. Fridays will still be days to get outside, explore nature and do community service, and the school will still focus on job shadowing, field trips and its positive, substance-free, bullying-free culture. “Our school’s about relationships — our relationships to each other, to our community, to nature,” Wolinetz said. The school will keep what has been working well, Smith said, and what has led to phenomenal academic growth scores. “The amount of learning that takes place in this building is outstanding,” he said, but he wants students to achieve more academically. Through the new model, Snowy Peaks students will soon have access to foreign-language classes, industry-certificate programs and college-level courses. Smith hopes to expand to grades seven through 12, as the renovation can house more than double the small school’s current student population. The school’s change came, he said, after he gave much thought to how best to use student-teacher time, read a few paradigm-shifting books and talked to principals of blended-learning options around the state. Snowy Peaks teachers have already done trainings with software provider Edgenuity, and Wolinetz said she will take all the online courses she will use with students later this summer — much like she would review a new textbook — to figure out which parts to focus on and how to enhance them. During the last week of school in the spring, students made lists of likes, wants and what-ifs for the renovation. Mostly what they wanted, Wolinetz said, was a less-structured school environment with comfortable places to learn. In the fall, they will be able to choose from couches, tall tables and other set-ups inspired by a field trip to Falcon Virtual Academy, a blended-learning school in Colorado Springs that jumped from 59 students to 420 in less than three years. “When students walked in, it was like immediately, ‘Whoa. This isn’t rows and desks,’” Smith said. Snowy Peaks is accepting applications for the 2015-16 school year. Interested students and families can contact principal Jim Smith at 970-389-8828 to set up a tour of the school and admission interview.